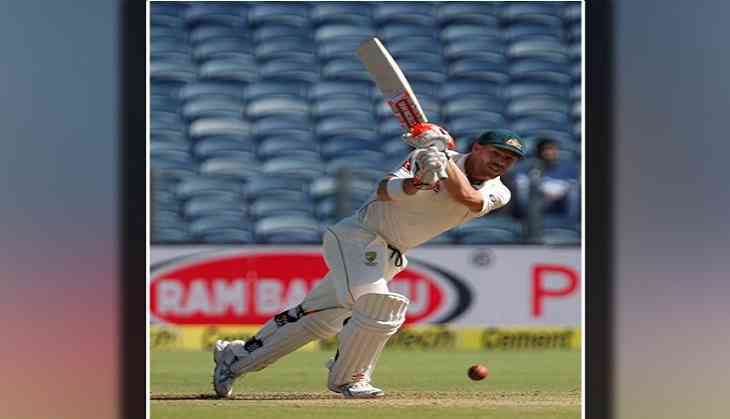 Openers David Warner and Peter Handscomb stitched an unbeaten century stand to help Australia reach at 225-2 at Stumps after Nathan Lyon starred with the bowl on Day Two of the second and final Test of the two-match series at the Zohur Ahmed Chowdhury Stadium here on Tuesday. In reply to Bangladesh's first innings score of 305, Warner (88) and skipper Steve Smith (58) not only stitched a half-century each, but they also went on to share a crucial 93- run stand for the second wicket. Warner, who delivered another big subcontinent score after scoring a century in the first Test in Dhaka, went on to stitch a 127-run stand with Handscomb (69) to lay a solid foundation for a big first innings score. The visitors still trail by just 80 runs and have eight wickets in hand. Earlier, Lyon took his wickets tally for the innings to seven to help Australia bundle out Bangladesh for 305. His fellow tweaker Ashton Agar also chipped in with two wickets. Mushfiqur Rahim was the top scorer for Bangladesh with his 68-run knock and he was well supported by Sabbir Rahman (66) as the duo brought the hosts back from the brink with their 105-run sixth-wicket partnership. Nasir Hossain (45) was the another notable contributor for the hosts.